The RMS Process Risk Management Module (PRM) identifies and addresses specific risks associated with simple to complex processes by via a systematic documentation and optimization methodology. The goal is to reduce risk to employees, mission, infrastructure, stakeholders, etc. to as low as reasonably achievable while providing opportunities to refine and improve the process continually. This methodology works for any process and discipline. Furthermore, it documents and incorporates multi- disciplinary inspired, continual improvement and risk management principles into the overall process. PRA Supports Critical Infrastructure Protection Programs: This type of optimization is vital to general risk management activities conducted by agencies and the private sector. It has great application for critical infrastructure risk management in the chemical, commercial, manufacturing, dams, emergency services, nuclear, agriculture and food, communications, defence industrial base, information technology, national monuments, postal and shipping, health care/public health, transportation, and water sectors. This flexible PRM methodology is summarized as follows: 1. 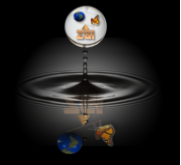 Process: A process is an organized, series of human and automated tasks, and task steps that brings about some result. This result includes physical / non-physical product, repair, maintenance, operation, surveillance, monitoring, etc. 2. Tasks: Processes are documented and broken down into standard or non-standard tasks. 3. Steps: Each task is documented and sub-divided into one or more steps Steps are documented. Steps are sequential and may branch based on various conditions. Step documentation include methods, agents, raw materials, required training, and much more. 4. Inherent Risk Assessment: Next, each inherent risk is identified and characterized at the step level by considering all components of the process systematically. Risks are assessed using a risk model, professional judgement or both. 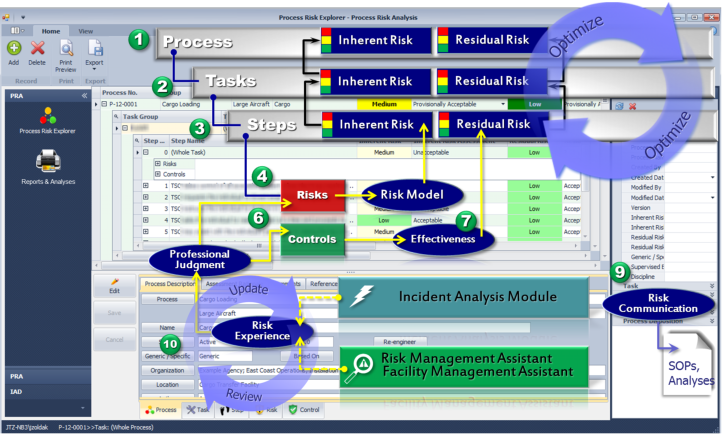 An algorithm aggregates the overall inherent risk at the task and overall process level providing a detailed profile of inherent risk. The accuracy of inherent risk assessments of existing processes increases when validated by data from the Incident Analysis Module (actual incidents with severity) and the Risk Management Assistant (potential risks assessed though inspections or audits). Inherent risk characterization is an art and science and sometimes proceeds in a circular process until the team feels that X% of the process risk is characterized. Additional risks may be added at any time in this ongoing, evolving process. 5. Re-Engineering: The next step in the PRM process is to review the process and identify re- engineering opportunities to improve efficiency, reduce waste, reduce risk to process completion, and reduce risk to individuals, infrastructure, and mission. This comprehensive re-engineering approach is improved when done collaboratively with process owners, process operators, engineers, scientists, supervision, management, security, facility managers, subject matter experts, and others. 6. Controls or Countermeasures: After all re-engineering opportunities are initially identified and addressed, further risk reduction is achieved by applying risk controls or countermeasures. Controls include from personal protective equipment, supervision, training, medical surveillance, work methods, surveillance, administrative controls, engineering controls, and more. PRM includes an extensive control library to get started. 7. Residual Risk Calculation: Next, the overall control / countermeasure risk-reduction efficacy is assessed as the residual risk which is rolled up from steps to the entire process via an algorithm. 8. Overall Process Risk Assessment: A final assessment is performed after the calculation of the residual risks. This is the overall risk assessment that indicates if the current risk level is acceptable or if further optimization is needed to achieve risk reduction goals. 9. Standard Operating Procedures: The PRM generates a risk-based Standard Operating Procedure and other process documentation that is important for training and supervision. 10. Continual Surveillance and Optimization: The process is continued to be followed after the implementation of a the risk-based SOP though the analyses of incidents and inspections. The PRM is integrated with the ZGi Incident Analysis Module, Facility Management Assistant, and Risk Management Assistant so that it is possible to identify the effectiveness of re-engineering and risk controls. This analysis may identify locations or conditions where the controls need to be refined. The PRM provides tools for creating a new version of the primary process and apply re- engineering that addresses local, time, demand, and other variations.